Proverbs 3:5, 6 Trust in the Lord with all your heart, and lean not on your own understanding; in al your ways submit to Him and He will make your paths straight. One day a farmer asked his two sons to walk a straight line across his field of freshly fallen snow. The first son saw the opportunity to do something simple and without hesitating, picked a tree across the field and walked straight to it. 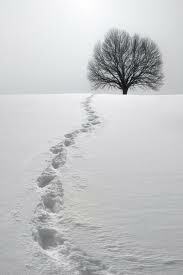 His footprints proved his confidence; each step lay there in perfect alignment. Wanting desperately to please his dad as much as his brother did, the second son carefully calculated each step he took. Heal to toe he placed each foot down to leave a trail as accurate as his brothers, but his focus was so intent on his feet that he had no idea the line he formed zigzaged as his balance was wobbling back and forth. Last week, my blog was about leaving impressions as we walk through life, I realized that my life’s most impressive footprints are the ones Jesus left when He was carrying me through the loss of my daughter in 1999. This week, as I faced new challenges, I found myself looking at my feet. Sometimes I try so hard to please my Father that I carefully calculate each step so as not to mess up. Like the farmer’s second son, I have had my vision so focused on my next step that I have lost my way. My heal-to-toe precision has only slowed me down and frustrated the people in my life that I long to lead. Especially my kids. Parenting is no easy task, and when we face battles we don’t know how to handle, it seems there is a default button that makes us look so carefully at our feet. I don’t know about you, but when I want desperately to do a job well, I sometimes forget the greater purpose, and only focus on the imprint I’m trying to make. Actually, more accurately: I stand there swaying with my stance too narrow and my balance all off, looking back at what I’ve done or said horrified that my footprints are way out of line. Some say, “slow and steady wins the game,” but slowing down and focusing on the game so much that I don’t even remember where I am headed does not win. It’s time to lift my eyes again, and do like the wiser brother did: focus on the goal, and just keep walking with confidence. God, help us all to keep our eyes set upon You and the goal You have set before us. We want to be less concerned with how we are performing than we are of where we are headed. None of us will hit the mark right on, but all of us will leave footprints behind us, help us to take steps worthy for others to follow.